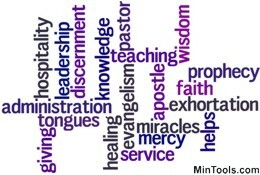 Although opinions differ on the actual number of spiritual gifts, God's Word clearly indicates a variety of gifts. You will find twenty different Greek words used for the gifts listed in the key passages on spiritual gifting. Herein you will find definitions for those possibilities. You will also find an additional listing of five possible gifts not found in the key spiritual gifting passages. In the scripture references listed by those gifts the context of the verses includes the same original language for spiritual gifts used in the key passages. This spiritual gifts list is limited to the possibilities listed in the key gifts passages and those that are suggested by context. Click on the name of a gift in these lists for its definition or simply keep scrolling down. The gifts in italics are repeated in one of the other passages. In addition to learning more about spiritual gifts, an Appendix in the Everybody Has a Part -- Getting a Grip on Spiritual Gifts book provides a list of the spiritual gifts with these definitions as well as characteristics seen in people with the gift. In addition to three different spiritual gifts tests, the Everybody Has a Part Spiritual Gifts Test Resource includes a 28 page document with the spiritual gifts definitions and possible uses.